At its core, the Reformation was about theology, as the reformers pushed for a return to the doctrines of the Christian faith as recorded in Scripture and testified to through the history of the Christian Church. These beliefs were written down during the Reformation era in a collection of works known as The Book of Concord. Read a summary of the faith confessed by the reformers, as well as Lutherans today, here: What Lutherans Teach, Believe, and Confess. For a more detailed description of the beliefs of the Reformers, read the Book of Concord (links below). If you’re just getting started, try the creeds first, then the Small Catechism, and then the Augsburg Confession. The links below all lead to an older translation of the text of the Book of Concord (with the exception of The Small Catechism). For an up to date translation that’s easy to read, check out The Book of Concord – A Reader’s Edition from Concordia Publishing House. 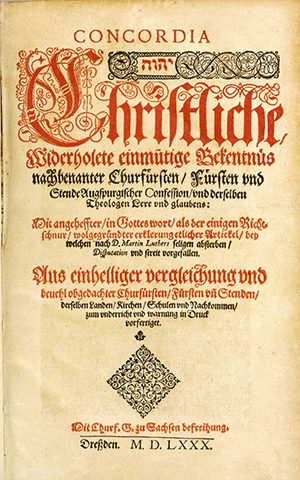 The introduction and commentary articles were written by Lutheran theologians from across the world as part of a series first published by the International Lutheran Council.